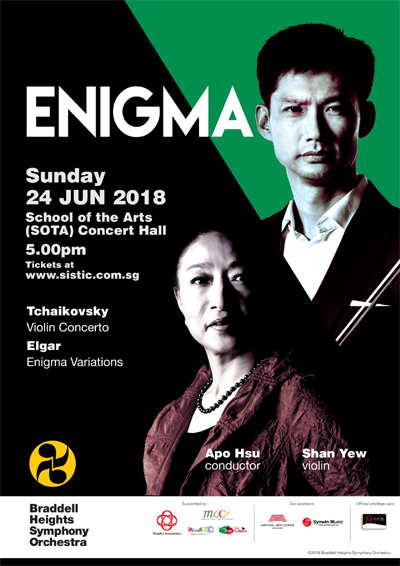 In the annual symphonic masterworks concert, BHSO will present Elgar’s Enigma Variations & Tchaikovsky’s Violin Concerto with soloist Shan Yew under the baton of Taiwanese Maestra Apo Hsu. Maestra Hsu’s last memorable performance with the BHSO was a sold-out concert in 2016 featuring Beethoven’s 7th Symphony & Brahms Piano Concerto No. 1 with soloist Albert Tiu, winning accolades from the musicians and the audience. In conjunction with the concert, Maestra Hsu will also serve as the master-teacher for a Conducting Master class for aspiring conductors, the fifth in the series of this popular platform that offers practical training for young conductors through opportunities to conduct the BHSO in these important works of the symphonic repertoire. Do like & follow our Facebook page for news bytes, discounts and ticket giveaways!